Scientists have remade Pac-Man using paramecia—microorganisms that you can control with a real joystick while a digital microscope relays images to a computer screen. They call it "Pac-Mecium" and it is not the only game they are playing. The user control the paramecium by just moving the joystick, which is connected to a controller that "controls the polarity of a mild electrical field applied across the fluid chamber, which influences the direction the paramecia move." I wonder how they make Pac-Mecium turn into super-Pac-Mecium. And who is chasing the poor Pac-Mecium, anyway? Evil amoebas? I sure hope so. The biotic game was created by a team lead by Stanford University Bioengineering professor Ingmar Riedel-Kruse, who thinks his games will increase awareness on these organisms and how science is going to affect the behavior of animals, human included. 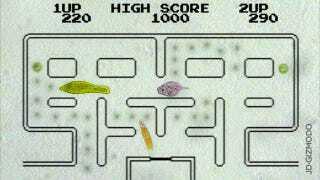 They also created versions of other classic games, like "POND PONG", "Ciliaball" and "Biotic Pinball." In the latter one, the paramecia are in charge of rolling the ball around the board.